BJC HealthCare and The Scholarship Foundation of St. Louis have named the 2018-2019 class of BJC Scholars. 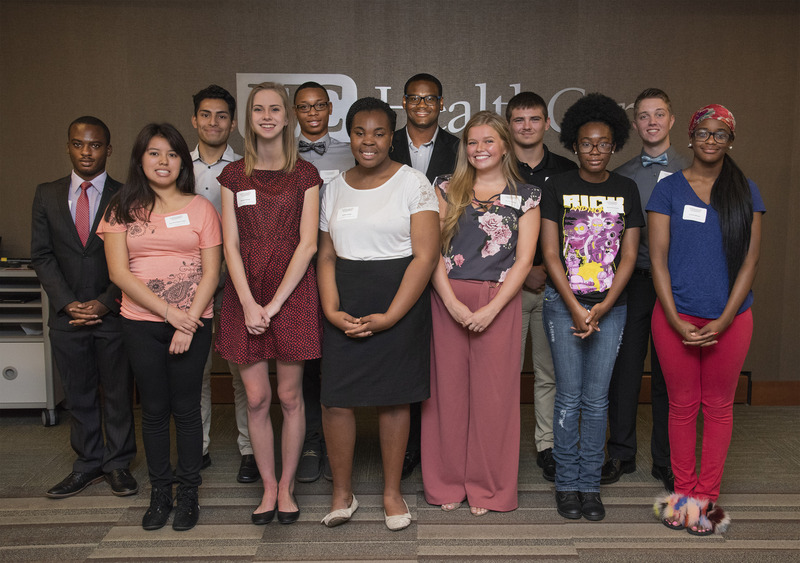 Twelve of the 14 scholarship recipients from throughout the region were on hand with family members and supporters to meet BJC and Foundation leadership and receive information about the scholarship award process at a July 17 orientation and luncheon in their honor. Two students from Illinois will be recognized in an upcoming event. In addition, two students from the inaugural class were on hand to share their experience with the incoming scholars. June Fowler, BJC senior vice president of communications, marketing and public affairs, shared with the students that she was the first in her family to earn a college degree. "I am telling you my title only to show what is possible with education as a great foundation," she said. "BJC wants to be a part of raising our community through higher education, and we don't want finances to be a barrier to those dreams." Noting that the date commemorated Nelson Mandela’s birthday, Scholarship Foundation executive director Faith Sandler quoted the late South African anti-apartheid revolutionary, political leader and philanthropist in her introductory remarks: "It always seems impossible until it is done." "Keep this message near you as you make your way through your education and into the workforce," said Sandler. "This is such an exciting moment. I wish you could look out from where I am and see your faces. It tells me a lot about our community and our next generation of leaders." In addition to administering the BJC scholarship program, the Scholarship Foundation is supporting the awardees and their parents in taking full advantage of other state, federal and institutional funds to which students are entitled, to ensure that the BJC scholarship award completes the funding required for full year attendance. The foundation also provides ongoing support that includes advising, workshops, financial aid counseling, participation in paid internship programs and additional funding opportunities if relevant. The current class received words of encouragement from two BJC scholars who completed summer internships at BJC and are getting ready for their second year of studies. "I came to the United States from Nigeria when I was 7 years old," said Omowunmi "Wumi" Akinade of Hazelwood, who interned in government relations and community health. "I always knew I would go to college because my mother told me I would, and I was set on being a doctor. I am a biology major and I joined multiple organizations. My favorite is African cultures because I can share that Africa is not one country, but a continent of many countries. I thank BJC for this scholarship because it has helped me concentrate on my studies and allowed me to take part in outside activities." "A year went by super fast!" shared Meleah White of University City, a chemistry major who interned in the BJC School Outreach department. "I've had the chance to shadow in departments I didn’t even know existed. The scholarship helped me focus on my academics and join clubs. There will be challenges in college but with the scholarship, finances won’t be one of them."